Kuzya, one of five Amur tigers released back in May in Far East Russia, crossed the Amur River and entered Chinese territory recently. All of the tigers, which likely lost their mothers by the hand of poachers, were released wearing satellite tracking collars after undergoing a year and a half of rehabilitation. RELATED: VIDEO: Epic tiger release in Russia is wildly successful. IFAW experts and other scientists involved in the rehab project receive daily information on the released animals’ location from the satellite monitoring. This valuable data is treated as ‘strictly confidential’ to prevent informing possible poachers of the whereabouts of the endangered big cats. Amur tigers are still subject for poaching due to growing demand for their skins and parts in Russia and neighboring China where tiger bone and pelts are coveted for its medicinal properties and as luxury home décor. Tigers are territorial animals; each individual occupies a particular area to live and hunt in. This is why young animals leave mother tigers at the age of around 1.5 to 2 years old to search for new grounds to live in. During their rehabilitation in the Primorsky region of Russia, Kuzya behaved more passively than sibling Borya who was very dominant. Kuzya spent time viewing and observing rather than running around and investigating their habitat like Borya. Perhaps, it is due to his dominance that Borya has hung around closer to female Illona closer to the site where the three were simultaneously released. Kuzya now seems to have left the territory in search of an exclusive territory of his own. 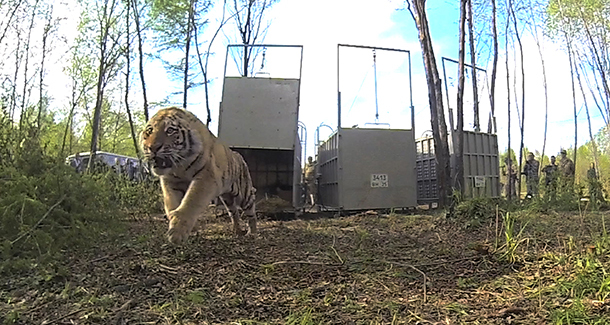 Experts from different agencies and organizations involved in the post-release monitoring of the tigers discard that Kuzya left in search of prey as the release habitat contained enough food sources. The concern at the moment is that the Chinese territory is much more heavily occupied by people with developed agriculture than the neighbouring Russian territory. Kuzya’s survival will depend on his ability to find food in this new territory and avoid conflict with humans. Currently, Kuzya is trying to avoid the settlements by staying closer to the forest but according to satellite imagery, he’s had to cross agricultural fields. There are trans-border corridors between Russia and China created deliberately for tigers, and we hope that the Chinese authorities will undertake measures to protect Kuzya. This also clearly demonstrates that there is a need for cross-border law enforcement cooperation between Russia and China to protect Amur tigers. IFAW’s China office is undertaking efforts to promptly inform the country’s official wildlife agencies about Kuzya’s routes in order to prevent possible human-tiger conflict. In the coming winter, IFAW will for the second year support the local tiger protection team to remove deadly snares that would hurt Kuzya. We are all keeping a close eye and our fingers crossed for the well-being of Kuzya and all the people that inhabit this region.